The Grand National is synonymous with one horse - Red Rum. This champion thoroughbred racehorse won this prized steeplechase in 1973, 1974 & 1977. In the two intervening years he finished second. The ultimate test of horse & jockey was tamed by his supreme efforts, an achievement which to this day has been unequaled. Remarkably, Red Rum never fell in 100 races. On Saturday 6th April, viewers across the world will remember the achievements of a truth racing legend & enjoy a racing spectacle - 2013 Grand National. 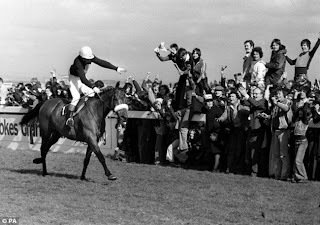 Red Rum was bred at Rossenarra Stud, in Kells, County Kilkenny, Ireland by Martyn McEnery. His name a creation of the first three letters of his mother & father. This bay son of Quorum out of a mare called Mared was born on the 3rd May 1965. Although bred to be a miler, he started his career as a sprinter, dead heated at 5f at Aintree, which used to feature Flat racing even before its steeplechase status. He was once ridden by Lester Piggott. In many ways Red Rum's story began when he was purchased by Ginger McCain for his new owner Noel le Mare. McCain, a Southport car dealer, trained the horse on the sands at Southport, Merseyside. The sea water was said to have helped ease an incurable bone disease of his feet. In fact, his trainer took him for a therapeutic swim in the sea of Southport before his first National appearance. In 1974, he won his second National when carrying 12 stone. The intervening years so him finish a gallant second. However, there was contention between Fletcher & McCain, which led to Tommy Stack taking the latter of the rides, after Fletcher angered the outspoken trainer by telling the press the horse didn't feel right after losing in preparation for the race in 1975. Red Rum always saved his best for the National and at the grand old age of 12 he achieved his record third in 1977. Red Rum was prepared for his 6th Grand National but retired after suffering a hairline fracture the day before the race. He may no longer been able to race but his celebrity status saw him leading the Grand National parade for many years. Among his guest appearances he switched on the Blackpool illuminations. On Saturday 6th April the world will remember Red Rum.